Vegan MoFo IV: It’s Finally Here! 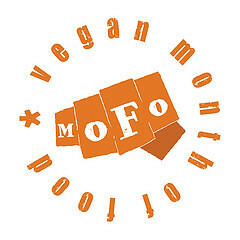 It’s finally here – Vegan MoFo IV begins today! As excited as I am for this MoFo, new beginnings always send me on a long path down memory lane, so I can’t help but reflect a bit on last year’s MoFo experience. Thirteen months ago marked the beginning of Vegan MoFo III. Thirteen months ago also marked the official beginning of my life as a vegan. During MoFo III, I posted every single day. During MoFo III, I lived with my parents and worked a part-time job with hourly pay. Coincidence? As if. During MoFo III, I thought to myself, Daily posts? No big deal! Imma rock this shizz and get all up in MoFo’s grill, every day! I’m a new vegan and nothin’ can stop me! Burnout?! What’s that?!? Ah, naiveté. This year, I live in a big-girl apartment and work a full-time, salaried, big-girl job. I often work 45 – 50 hours a week, and sometimes when I get home from work I’m absolutely exhausted, and the thought of writing up a blog post (not to mention making food about which to blog!) seems like the foodie equivalent of climbing Everest while wearing a bikini, keeping my eyes shut, and having noodles for arms. Plus, as I’ve said before, it’s deadline time for writers at my company, so things are extra busy these days. Not to mention the fact that I’ll be on a sUp3R sP3c! @L work trip this weekend, working 12-hour shifts on Saturday, Sunday, and Monday. I’ll be lucky if my destination (a small town outside Columbus, Ohio) has any vegetarian options, never mind sweet vegan eats that’d merit a MoFo post. So, November? Yeah, not really the ideal month for hot MoFo action. Nomadic Noshing. I’ll try out some [mostly] authentic foods inspired by places I’ve visited, places I’ve lived, and places I’d like to visit. Cookbook Challenges. Let’s face it – there are some cookbooks I underuse or (heaven forbid!) don’t use at all. I’ll choose a couple of those sad, neglected books and pick recipes that’ve slipped under my radar ’til now. Erudite Eats. I’ll make foods inspired by my favorite books, films, works of art… that sort of thing. I’m really excited about this one! Keepin’ it Raw. I’ve dipped my toe into the ocean of raw foods before, but ’til now I’ve kept it simple with chocomole, banana soft serve, zucchini noodles, and simple stuff like that. It’s time to wade on in and go for a swim! Spreadin’ the Bloggy Luuurve. Y’all have some great recipes out there, and it’s high time I stop just bookmarking or starring them or adding them to my Crap I Want to Make document, and actually make them! I’ve also got another idea to take MoFo to the next level: interactivity. When I know I have lots of time to devote to cooking, I’ll ask you to challenge me, to suggest recipes for me to try. If I get too many suggestions, I’ll use a random number generator to choose a few of your suggestions and cross my fingers and toes that I don’t wind up making opera cake and vegan turducken. Beyond those special topics and themes, I’ll also post recipes, product reviews, and – let’s be honest here – the occasional cop-out food survey. And to start things off, how about one of those recipes? After roasting your squash, heat coconut milk and spices in a pot. Transfer all ingredients to a blender (in batches, if necessary), and puree until smooth. Serve with sriracha for a kick of spice. …yep. That’s it. Simple and quick. :) I think I liked this soup, but I’m not sure. I definitely liked the idea of it, but my reservations towards coconut-flavored things kept me from falling madly in love with it and running off to Vegas to get hitched. Maybe you’ll like it, though. …and with that, I’ll wrap up my inaugural MoFo IV post. You should know that I essentially wrote this post twice yesterday because WordPress ate the first one. You should also know that, despite it having been a frustrating day in the food department (burnt oven fries and dry pie dough and stupid kitchen towels that kept falling off the oven handle, oh my! ), I resisted my urge to cry and/or give up on MoFo before it began. Instead, I immediately rewrote the post. I know that I forgot a totally awesome title for a couple of my themes/topics, but other than that I think I recreated it fairly well. An inauspicious beginning, perhaps, but things can only go up from here, eh? Anyway – happy MoFoing, and I’ll see y’all tomorrow! Looks like a great plan – I’m also excited to see your Erudite Eats! Sorry your first post got eaten. Appropriate, though, right? 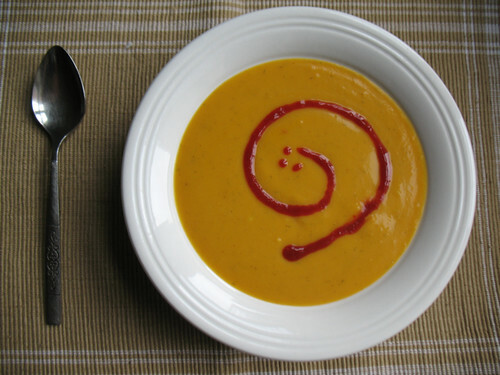 If I were WordPress I’d scarf down yummy soup posts. Great post, Kelly. It sure is amazing how much can change in a year, right?! LOVE your themes, and looking forward to some great reading!